Passed away at John Grey Centre on January 18, 2019 at the age of 79 years. Laboura was born in Conche on June 8, 1939 to William and Mary (Frizzel) Carroll. She married William (Billy) Whelan on November 17, 1960 and together they raised eight children. 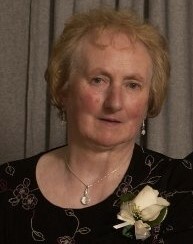 She leaves to mourn her children; Debbie (Ted Companion), Ethel (Gerard Byrne), Bonita (Sean Temple), Kenneth (Angela), Randy (Carol), Claude (Stephanie), Velma (Jamie Haas), Willis (Sue); Grandchildren Elizabeth, Geoffrey, Lyndon, Kirk, Kristen, Andrew, Madison, Morgan, Mia, T.J, Keisha, Cole, Bailey, Cassy, Mack; Great-Grandchildren Austin, and Lois; Siblings Mercedes Jackman, Adian (Linda), Hilda (Michael Symmonds), Mariella (Frank Kearney) and Regina; as well as many nieces, nephews and extended family. She was predeceased by her husband Billy, her parents her brother's Wilbert Ralph and Clyde, as well as brother/sister in-laws Tom Jackman, Tom and Bride Connolly. Visitation was held at the Sacred Heart Roman Catholic Church in Conche from where the funeral service was held on Monday, January 21 at 11:00 am with Fr. George officiating. Interment followed. Funeral Services entrusted to Kerry M. Fillatre's Funeral Home, St. Anthony and Roddickton, Lee Nippard Funeral Director.